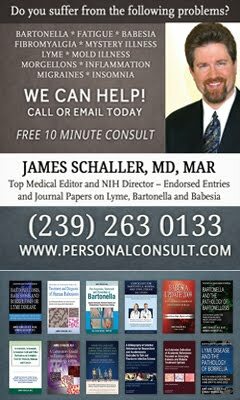 James Schaller, MD, MAR, has spent many years researching and treating Bartonella and Babesia, two important tick-borne infections implicated in chronic Lyme disease. He is a prolific writer who has published several books on these infections, as well as on other topics relating to chronic illness and tick-borne infections. Below I share with you Dr. Schaller's recently-compiled symptom checklists for Babesia and Bartonella, which most often cannot be adequately diagnosed via lab tests. Bear in mind, symptoms for different infections often overlap, which is why having an exhaustive list of symptoms for each infection may help to sort out which infections are predominant in a person's symptom picture. For example, fatigue and headaches are symptoms of a myriad of diseases, but if ten or twenty other symptoms in the body point to Babesia, it may be that this is the predominant cause of a person's fatigue and headaches. (Note: All information has been re-copied directly from Dr. Schaller's documents, by permission, and has not been modified for any reason). 1. Insomnia [If profound fatigue this might not apply]. 2. Current anxiety that was not present at age ten. 3. Current anxiety or depression not present at twenty years old. 4. Knee-jerk emotional responses worse than past decades and worsening. 9. Depression that is not fully controlled. [Improvement of mood is not successful in depression treatment]. 22. Cursing or hostile speech that is worse over time. 24. Red papules of any size. 25. Skin tags including ones removed by dermatologist or shaved off. 29. Skin findings showing increased tissue formation that is increased over the flatness of surface skin. 30. Skin showing blood vessels that are too large or too many for the location of the blood vessels, e.g., surface thigh and calf skin with very thick surface blood vessels. Or legs, upper arms or shoulders have explosions of many fine blood vessels. 31. Increased addictions that are more resistant to recovery than average. 32. Increased impulsivity in contrast to past years or past decades. 33. Burning skin sensations [this may have many causes]. 35. Skin erosion without a clear cause such as a fire or chemical burn. 36. Minor cuts or scratches which heal slowly. 37. After a surgery, you heal very slowly. 38. You have two tick or flea infections with two positive tick or flea borne viruses, bacteria or protozoa. [Bartonella has >30 published species in public genetic databases and has more vectors than possibly any infection in the world. Therefore, the presence of other infections such as tick borne viruses, bacteria or protozoa, should raise suspicion. 39. Exposure to cats and dogs in excess of very incidental rare contact. 40. The patient’s mother is suspicious for Bartonella based on newer direct and indirect testing. 41. A sibling, father, spouse of child with any tick or flea-borne infection who shared a residence or vacation with proximity to brush. 42. Exposure to outdoor environments with brush, wild grasses, wild streams, golf courses or woods. 43. Outdoor expose in locations such as brush, wild grasses, wild streams or woods which happened without the use of DEET or without very high off- gassing essential oils on exposed skin areas. 44. The outdoor exposures such as brush, wild grasses, wild streams or woods which occurred without permethrin on shoes, socks and all clothing. 45. Clear exposure to lice, fleas or ticks. [Bartonella is carried by a huge number of carriers, but for now, the % that carry Bartonella is not known. Further, the capacity to detect all new species in the vectors or in humans infected, does not exist or is not routinely available in direct testing of all human infectious Bartonella organisms in both large or specialty labs]. 46. Stretch marks in eccentric locations, e.g., arms, upper side under armpit, around armpit or on the back. 47. Stretch marks filled with red, pink, purple or dark blue color. Certainty claims or criticism about Bartonella positions without reading at least parts of 1,000's of articles is confusing. How is this possible with new Bartonella findings and understandings each month? There are also new species genetically sequenced to show uniqueness almost every month in public databases. In this spirit, this scale is meant to merely increase suspicion of Bartonella, which is a super stealth infection that takes perhaps fifty days to grow out on some bacteria growth plates, and floats in the blood as it lowers fevers. It also clearly suppresses some key immune system fighting chemicals. Cure claims are made without the use of indirect testing markedly documented in superior journals, but which are not used by immensely busy clinicians working full-time. Dr. Schaller is the author of 29 books and 27 top journal articles. His publications address issues in at least twelve fields of medicine. He has the most recent textbooks on Bartonella. He has published on Bartonella under the supervision of the former editor of the Journal of the American Medical Association (JAMA), and his entries on multiple tick and flea borne infections, including Bartonella [along with Babesia and Lyme disease] were published in a respected infection textbook endorsed by the NIH Director of Infectious Disease. He has approximately six texts on tick and flea-borne infections based on his markedly unique full-time reading and study practice, which is not limited to either finite traditional or integrative progressive medicine. Since he has a medical license he has been able to sort through many truth claims by ordering lab testing. He does not follow truth claims without indirect testing laboratory proof. He has read full-time on these emerging problems for many years. C COPYRIGHTED 2011 JAMES SCHALLER, MD version 11. This form cannot be altered if it is printed or posted in any manner without written permission. Posting in a critical negative evaluation is forbidden. Printing to assist in diagnostic reflections is encouraged, as long as no line is redacted or altered including these final paragraphs. Dr. Schaller does not claim this is a flawless or final form, and defers all diagnostic decisions to your licensed health professional. Below are examples of signs, symptoms and indirect ways to help increase the diagnosis of Babesia. An examination of public genetic databases shows well over thirty-five species exist, many of which have variants. Please note that an unknown percentage of people infected have no symptoms, at least for many years. This checklist is not meant to be used as a definitive tool to diagnose Babesia. I would suggest that no definitive 100% or even 98% sensitive tool exists. My goal is merely to decrease illness resulting from false negative patients, i.e., people who are positive but do not show up positive on a basic direct test. Indeed, it is not uncommon for a patient with Babesia to present with a negative test result over ten times, regardless of the lab, and then to show up positive on DNA testing when exposed to two or three protozoa treatments for three days, or to have positive antibody testing six weeks after a similar provocation trial. I do not oppose or endorse such approaches, but feel it necessary to mention that this has happened with “malaria” prevention treatment. Additionally, there have been instances in which the use of herbs, such as artesunate, for cancer prevention, has resulted in an unintended outcome: the conversion of a Babesia titer from negative to positive. The path to expertise with Babesia is not simply to read a summary article or guidebook (of which I have authored four on the topic). Nor is expertise acquired by viewing the sickest 1% of patients as the “norm” in Babesia diagnosis. If someone seeks expert knowledge of the infection, it begins by reading the entire world Pub Med literature over a few years, then utilizing that knowledge by focusing on treating this infection for over five years. In summary, how can any certain Babesia position exist, when new species that infect humans are routinely emerging, and for which there is not even a direct test—regardless of sensitivity? 1) I react to any derivative of Artemisia (Sweet Wormwood). *Note: the reaction does not need to last more than a day and any immediate stomachaches or loose stool do not apply. 2) I react to a malaria drug. (It requires profound wisdom for a clinician to distinguish between a side effect and a reaction caused by an effective Babesia treatment. For example, insomnia caused by the synthetic drug Larium is meaningless, since Larium has this as a side effect in uninfected patients. But fatigue and a severe headache resulting from a teaspoon of Mepron on day one are very suspicious symptoms for a known protozoan like Babesia or Malaria or other similar infections that are newly identified genetically). 42) An enlarged spleen (under your left rib cage). This is falsely believed to be a common human sign; actually it is very rare. 43) A yellow hue on eyes, hands and skin (jaundice) with no other clear cause. 44) Sexual contact is a debated form of communication of some tick and flea borne infections. I have no position. Isolation in a body fluid does not mean that is a route to spread the infection. If you and your healer feel this is a possible route of infection, has the patient had intimate contact with the sharing of body fluids with an infected person? 45) The patient’s mother is suspected of having or has been diagnosed with Babesia, Ehrlichia, Rocky Mountain Spotted Fever, Anaplasma, Lyme or Bartonella based on newer direct and indirect testing or clinical signs and symptoms. 46) A sibling, father, spouse or child with any tick borne infection who shared a residence or vacation with proximity to brush (wooded area). 47) Exposure to outdoor environments with brush, wild grasses, wild streams, golf courses or woods in excess of ten minutes in any location lived or visited since the age of eighteen months of age. 48) Outdoor exposure in locations such as brush, wild grasses, wild streams or woods which took place without the use of DEET or without very high off-gassing essential oils on exposed skin areas. 50) After Babesia treatment with clear protozoa killing agents used also to kill malaria, IL-6 moves from very low to an increased level. 51) After Babesia treatment with clear protozoa killing agents used also to kill malaria, IL-1B moves from very low to an increased level. 56) Waves of generalized itching [this infection and inflammation sign is not limited just to Babesia]. 57) Spike of a fever over 100.5 after a possible tick bite. 61) Excess fat in lower belly area that is in excess of lifestyle and activity. 64) Psychiatric label(s) given for all of your troubles or a child or relative’s troubles when clear medical problems exist as shown by abnormal laboratory results (only if wide testing is done which includes inflammation and anti-inflammation chemicals, hormones, nutrient levels, and other immune system chemicals). 65) You have two tick or flea infections with two positive tick or flea borne viruses, bacteria or protozoa. The presence of other infections such as tick borne viruses or bacteria raises suspicion of a Babesia infection. 66) Your clinician understands the use of indirect testing and feels your lab pattern is suggestive of the presence of Babesia. This involves more than an ECP spike. 67) Since direct testing for Babesia by any lab misses many human species and is of variable reliability, and the common presence of Bartonella suppresses some antibody tests, a positive or “indeterminate” is likely a positive. Have you had an “indeterminate” or “borderline” Babesia result? 68) You have neighbors living near you with a tick or flea infection diagnosis. 69) Your pet(s) or family animals of any type, e.g., horses, have had outdoor exposures to areas such as brush, wild grasses, wild streams or woods. If the pets were animals such as dogs, which can be given anti-tick and flea treatments, were these animals always on schedule with these treatments? 70) Have you had clear exposure to ticks in your current or past homes as an adult? 71) Have you had clear exposure to ticks during vacations or other travels? No blood smear will be positive for Babesia unless you have a profoundly massive number of infected red blood cells, which is rare. Therefore, no blood smear should be considered negative unless it has been examined for thirty minutes. While a 2-3 minute exam of large white blood cells may be fully sufficient to identify cancers and other diseases, a search for over eighty Babesia red blood cell presentations under 1000x, as found in my Hematology Forms of Babesia book, requires at least thirty minutes, which requires private contracting with a microbiologist or pathologist or a favor from a lab director. Please appreciate that stains help define whether a substance is what it appears to be. Babesia is an emerging infection. Any certainty claims or criticism about Babesia positions without reading at least parts of 1,500 articles is a premature certainty. Again, new Babesia species are emerging every one to four months. Indeed, even a new protozoan has been found that looks like Babesia under a high powered microscope. But when it is genetically sequenced it is not Babesia or immature malaria, which can look similar. It is a new infection. Therefore, since this is a new emerging illness, this scale is meant to merely increase awareness of Babesia, an infection that can kill patients of any age. 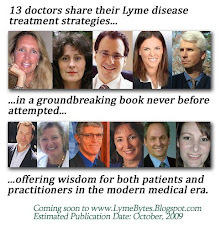 Writings in the past fifteen years have either seen Babesia as a mere “co-infection” or a footnote of a spirochete infection [Lyme]. Anything that can hide for a couple of decades, and then possibly kill you with a clot or by other means, is not a casual infection. Babesia cure claims should be made with the use of indirect testing birthed from extracts of superior journals read over five years. Currently, these many indirect well-established lab test patterns are not used or understood by immensely busy and smart clinicians working full-time. While this is fully understandable, I hope it may change in the coming decade. Dr. Schaller is the author of 29 books and 27 top journal articles. His publications address issues in at least twelve fields of medicine. He has published the most recent four textbooks on Babesia. He has published on Babesia as a cancer primer under the supervision of the former editor of the Journal of the American Medical Association (JAMA), and his entries on multiple tick and flea borne infections, including Babesia [along with Bartonella and Lyme disease], were published in a respected infection textbook endorsed by the NIH Director of Infectious Disease. 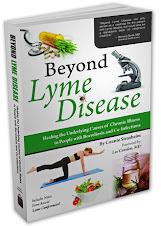 Dr. Schaller has produced six texts on tick and flea-borne infections based on his markedly unique full-time reading and study practice, which is not limited to either finite traditional or integrative progressive medicine. With a physician’s medical license, he has been able to sort through many truth claims by ordering lab testing. He does not casually follow the dozens of yearly truth claims, without indirect testing laboratory proof. He has read full-time on these emerging problems for many years. He is rated a TOP and BEST physician. One of these award ratings is based on physician peer ratings. COPYRIGHTED 2011 JAMES SCHALLER, MD, MAR version 26. This form may not be altered if it is printed or posted, in any manner, without written permission. Posting a critical or negative evaluation is forbidden. Printing to assist in diagnostic reflections is encouraged, as long as no line is redacted or altered, including these final paragraphs. Dr. Schaller does not claim that this is a flawless or final form, and defers all diagnostic decisions to your licensed health professional. As seen on TV products is As Seen On TV products and we’re confident you will find what you’re looking for. ensure our customers have an optimal shopping experience. I had an "inconclusive" result on a Lyme test. Have been diagnosed with fibromyalgia and suffer from debilitating fatigue. Could I have babesia or bartonella??? Nice post. Thanks for sharing useful information here. Keep posting. Schaller is pretty dedicated to this specialty! But wow, a search for over eighty Babesia red blood cell presentations under 1000x requires at least thirty minutes of review with a microbiologist or pathologist? I don't think too many of us are getting this special treatment. Thanks for this, learned a ton.